A new, landmark report shows that hopes of a long-term golden era in American oil and gas production are unfounded. America’s energy landscape has undergone a dramatic shift over the last decade—literally and figuratively—as a result of the widespread use of horizontal drilling and hydraulic fracturing (“fracking”). Whole areas of the country have been transformed in a matter of months, while the fossil fuel industry has reversed the decades-long decline in crude oil production and increased natural gas production to record highs. Thanks to shale gas and tight oil (“shale oil”), by 2013 annual crude oil production was 24% higherand natural gas was 20% higher compared to just ten years earlier. With domestic oil production growing month after month, many oil experts predict that the country’s output will rise to as much as 12 million barrels a day over the next decade, which would mean the country will be swimming in oil the way it is currently dealing with a surplus of natural gas. Analysts at Turner, Mason & Company, a Dallas engineering consulting firm, say the country could hit a saturation point when production hits 10 million to 10.5 million barrels a day, at which point large exports will become necessary or drilling and production may have to slow. While the so-called “shale revolution” came as a complete surprise to most analysts and government forecasters, the conventional wisdom now appears to be that this is the beginning of a long-term transformation. Production of shale gas and tight oil in the U.S. is expected to grow at breakneck speeds throughout the decade, with natural gas production increasing for the next 25 years while domestic oil production peaks by the end of this decade and slowly declines to near current levels by 2040. Not only will supplies expand, according to conventional wisdom, but oil and natural gas prices will remain stable and relatively low for decades to come. Putting aside important questions about the validity of these claims (for example, that shale gas is better for the climate than coal), assumptions that the “shale revolution” is a long-term game changer are undeniably transforming energy policy in the U.S. and abroad. But what are these assumptions based on? While oil and gas companies and energy market analysts regularly come out with their own estimates, the U.S. Department of Energy (DOE) is universally viewed as the preeminent source of unbiased projections of future U.S. energy supplies. Each year the DOE’s Energy Information Administration (EIA) releases its Annual Energy Outlook (AEO), which provides a range of forecasts for energy production, consumption, and prices. Policymakers, the media, investors—almost all receive the EIA’s estimates with little to no skepticism, despite the agency’s poor track record. A quick glance at what the EIA was forecasting just ten years ago is illustrative. In its 2004 AEO Reference Case, the EIA forecast oil prices to be $23.61 per barrel in 2010 and $26.72 per barrel in 2025. In reality, oil prices in 2010 were three times higher than forecasted and persistently remained over $100 a barrel until just a few months ago. Earlier this year, the EIA slashed its estimate of technically recoverable tight oil from California’s Monterey Formation—which just three years previously had been estimated to hold two-thirds of all U.S. tight oil—by a whopping 96%. The author of the original EIA estimate, INTEK Inc.,admitted that it had been derived from oil company presentations rather than hard data. The downgrade occurred a few months after Post Carbon Institute published an analysis that showed—using actual production data from the Monterey Formation—that the federal government’s estimates were wildly optimistic. But during the three years when the EIA’s initial estimates were rolling off the tongue of every oil and gas industry lobbyist in California, policy discussions in the Golden State was dominated by discussions of how to use the wealth from this soon-to-come bonanza. In the Department of Energy’s defense, the EIA conducts regularretrospective reviews (which clearly show how badly they’ve missed the mark) and provides disclaimers to its estimates and forecasts. Estimates of technically recoverable tight/shale crude oil and natural gas resources are particularly uncertain and change over time as new information is gained through drilling, production, and technology experimentation. Over the last decade, as more tight/shale formations have gone into production, the estimate of technically recoverable tight oil and shale gas resources has increased. However, these increases in technically recoverable resources embody many assumptions that might not prove to be true over the long term and over the entire tight/shale formation. However, like most fine print, these are hardly ever read or noted and seem to have no impact whatsoever in tempering optimism—either within the EIA or amongst the policymakers, media, investors, and general public who rely upon it. Drill Deeper and What Do You Find? The result of our analysis—Drilling Deeper: A Reality Check on the US Government’s Forecasts for a Lasting Shale Boom—was just released. What did we find? That the so-called “shale revolution” has more in common with the California Gold Rush and the Dot-Com Bubble than a new golden age of energy abundance. The implications of this are profound. If the “shale revolution” is nothing more than a temporary respite from the inevitable decline in US oil and gas production, then why are we rushing to rewrite our domestic and foreign policy as if we’re going to be “Saudi America” for the rest of the century? And it raises painful questions about whether all of this—the tens (potentially hundreds) of thousands of wells drilled across the landscape; the billons of tons of fresh water used and contaminated; the millions of truck trips and damaged infrastructure; the NOx pollution and methane emissions; the flaring wells in North Dakota that can be seen as brightly at night as Minneapolis from space; the social impacts of booms and busts on communities across the country; the hundreds of billions of dollars invested in fracking rather than renewables; etc.—is worth it. 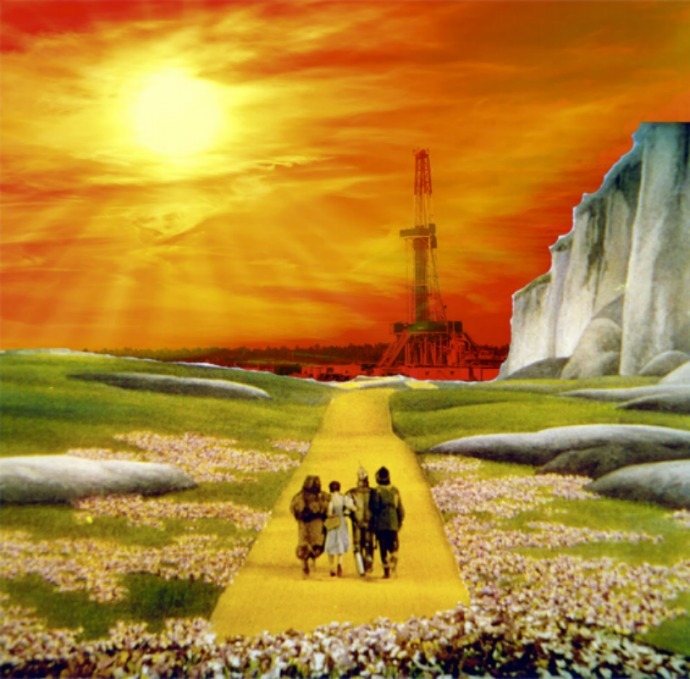 It’s not too late to choose a different path, but first we have to recognize that the yellow brick road we’ve been walking isn’t what it’s fracked up to be. This work is licensed under a Creative Commons Attribution-Share Alike 3.0 License. Click here to read more articles and reports on Common Dreams. The drilling boom is an emerging financial train wreck, and the focus has moved to stock market plays. Drilling companies have found that many, if not most, shale wells do not repay the cost of drilling, Their balance sheets are loading up with debt. If interest rates rise, so will the bankruptcies of shale drillers.